From the pop-up to the flip-style, bathtub stoppers come in a variety of designs. The individual design affects not only how the stopper operates but determines its method of removal as well. Employing the proper technique for removing these stoppers avoids costly damage to the stopper or your drain. Stopper removal varies by design. From the pop-up to the flip-style, bathtub stoppers come in a variety of designs. The individual design affects not only how the stopper operates but determines its method of removal as well. Employing the proper technique for removing these stoppers avoids costly damage to the stopper or your drain. True to its name, the pop-up stopper raises and lowers with the flick of a lever. The lever controls a lift rod, located behind the wall. This lift rod manipulates the rocker arm attached to the underside of the stopper. To remove the stopper, first toggle the stopper to the "up" position. Squeeze each side of the stopper, then pull straight up. Continue pulling until the rocker arm emerges along with the stopper. On a plunger-type drain, the stopper remains hidden inside the overflow pipe behind the wall. A toggle lever controls the action of the stopper. 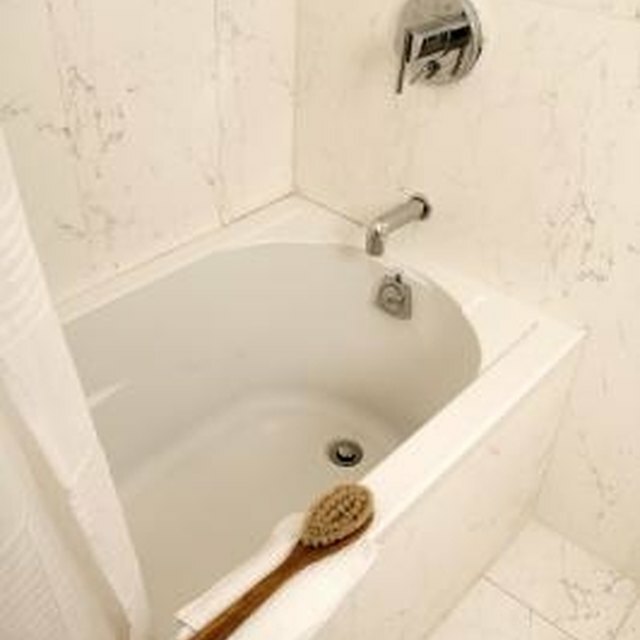 In the closed position, the stopper blocks the drain, preventing water from leaving the tub. Accessing this stopper requires removal of the screws from the toggle lever cover plate. With the plate loose, pull it straight away from the side of the tub. The emerging lift rod assembly contains the stopper at the bottom. Instead of relying on a lift mechanism, the threaded stopper contains a center post that screws into the drain. Operation of these stoppers differs by model. Some models push in and out, while others require a twisting action to open and close. To remove these stoppers, first attempt to turn the open stopper counterclockwise. If this fails, look for a knob at the center of the stopper. Unscrew the knob to reveal the head of a screw. After loosening the screw, remove the stopper from the drain. The manually operated flip-style stopper pivots back and forth. The stopper requires a touch of the toe or hand to open or close. A suction cup included with the model allows for removal of the stopper. Close the stopper and position the cup over the center of the drain. Push down on the middle of the suction cup to create a seal around the stopper, then pull the suction cup away. The vacuum created by the suction cup removes the stopper from the drain. "Popular Mechanics Complete How-To"; Albert Jackson et al. What Are the Hazards of Walk-in Freezers?